The formation of the European Union was, in part, designed to give the bloc a combined clout and market voice apart from the dominant presence of the US and its policy. Now, at this most dangerous junction, this administration’s policy decisions are rippling across the pond once again. European Central Bank officials considering when to end their bond-buying program have a new reason to move carefully: U.S. inflationary pressures are helping to push up euro-zone borrowing costs. President Mario Draghi and his colleagues spent years insulating the single-currency area from global financial markets as it recuperated from a double-dip recession, debt crisis and brush with deflation. Now yields on German bonds -- the closest thing to a regional benchmark -- are rising largely in tandem with U.S. Treasuries as the world undergoes a synchronized expansion, suggesting that decoupling is coming to an end. 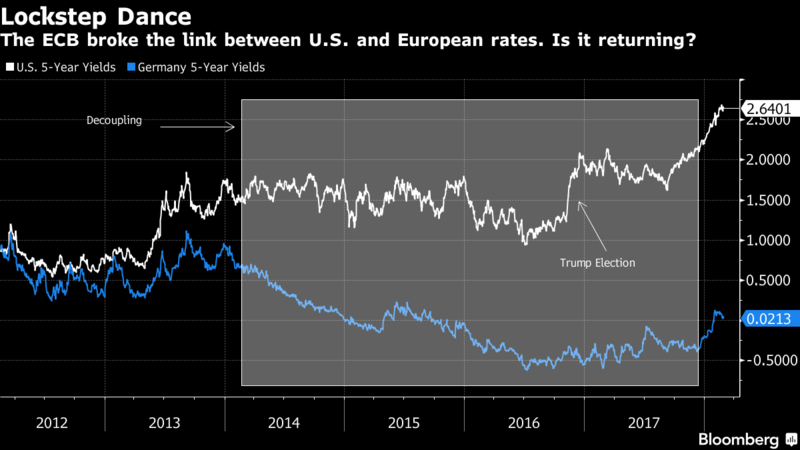 Higher U.S. yields spilling over to Europe could force the ECB to prolong asset purchases even further after the current phase ends in September. Unlike the Federal Reserve, which is predicted to raise interest rates at least three times this year to keep consumer prices under control, the Frankfurt-based institution is still well short of its inflation goal. Draghi has repeatedly urged persistence in providing stimulus, and has an opportunity to renew his call on Thursday, when the Governing Council meets to set policy.